This unusual piece of handmade dichrioc glass has lines in it of golden colors with pink hues. Its been woven with pink peaks on the side to bring out the pinks hues. Topped with a bali silver bead and swirled with sterling silver. This is truly one of a kind. 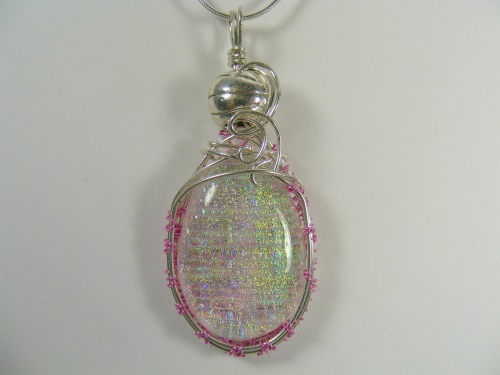 Measures 2 1/2" by 1" wide and comes with a sterling silver snake chain.